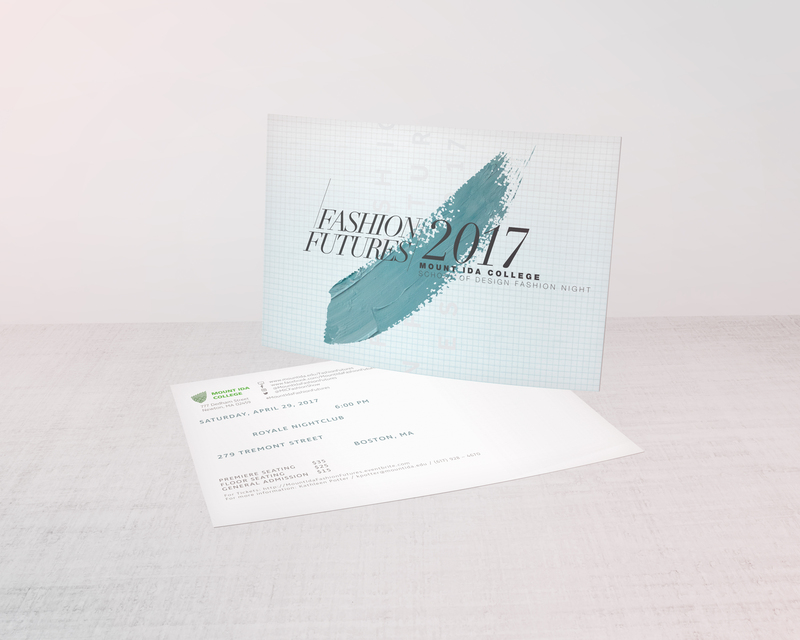 DESIGNING THE COLLATERAL FOR THE MOUNT IDA COLLEGE FASHION FUTURES FASHION SHOW, USING A SUPPLIED LOGO. For this project, I was tasked with creating a look for the 2017 iteration of the Mount Ida College Fashion Futures show. 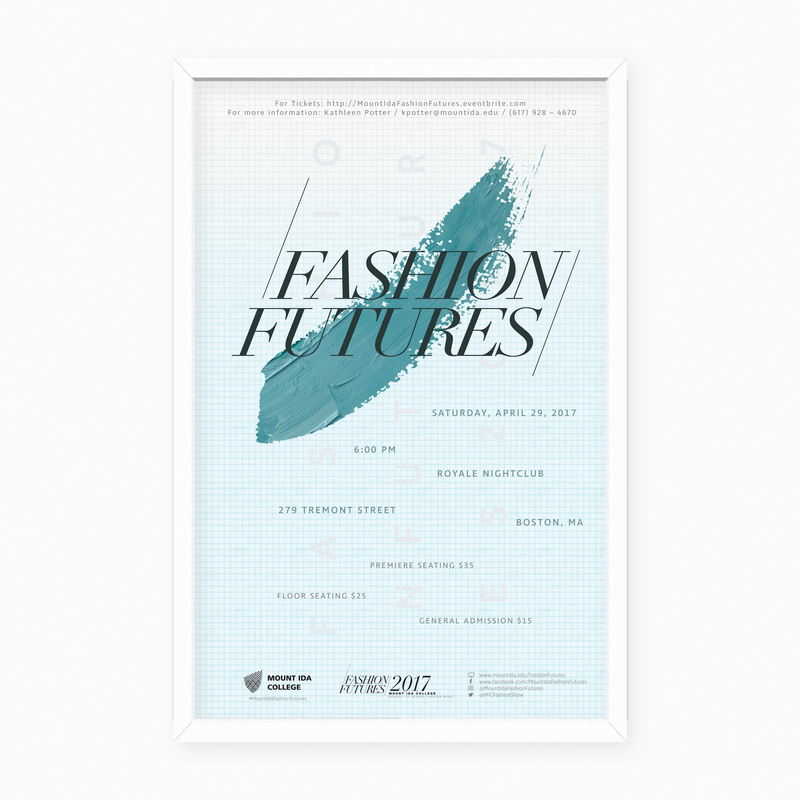 The event was not only geared towards the friends and families of fashion design students, but also leading industry professionals in the Boston area. The identity needed to be equally as appealing to both demographics. To appear current in the worlds of both graphic and fashion design, I wanted to make use of a green color, similar to Pantone’s color of the year, “Greenery”. I wanted to deconstruct how a designer comes up with an idea and creates a physical piece and turn this into a visual element. To do this, I decided to play off a linear/organic relationship; linear representing the physicality of art and design, organic representing the ideation process. First, I began to explore how linear and organic would intersect. Would there be patterns and grids? Or solid shapes? After deciding to make use of paint stroke to embody creativity, I had to make create the right look. I wanted a stroke that still had a very textural and dynamic quality to it, which took much experimenting. Across the marketing collateral I created, an organic paint strokes sits above a linear grid structure. Their contrast embodies the creative process. All the type appears disjointed- individual bursts akin to the scattered pieces of a designer’s process that somehow come together in the end to create a finished piece. It took a lot of work to make sure that the type appeared considered, while still being sporadic. The main format utilized for the collateral was the poster: it could be plastered around the greater Boston area to easily raise awareness of the event. A postcard was selected as it could be a casual reminder sent out to friends and family, while a formal invitation to business professionals. Overall, this project was an original concept that was very abstract. I knew what I intended to do with it, but describing it was difficult. By the end of the project, I confidently understood my concept and how my designs visually supported and communicated it. Through creating a campaign using completely original imagery and techniques, I was able to really refine my own design process and figure out how I get to the root of the problem.